Nico: I would play Black 1 at c. It both strengthen the black upper and lower groups, making two correct extentions of 3 moku from a 2-stones wall. It also respects the symmetry of the board. If White plays there instead, this would be devastating. A play at b also respects the symmetry but to a lesser extend, it looks less urgent. A play at a seems to be the least urgent one. The two others look bigger. 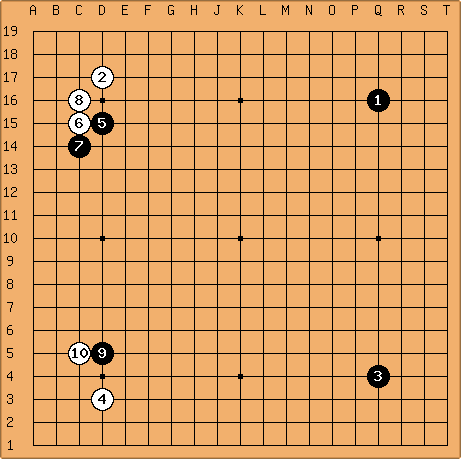 After Black keeps on playing at a.
GoSeigen states that Black center is bigger than White's two sides. 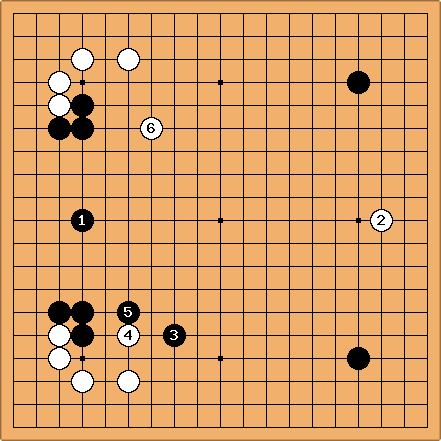 Bill: Rui NaiWei said that, although it was great to study with Go Seigen, he often changed his mind. It seems that he did so here. In 21st Century Go, vol. 1, which came out in 1997, the same year as A Way of Play for the 21st Century, he says that after W 2, Black has a hard time winning with komi. After B 3, he gives W 4 - W 6, which seems more reasonable for White. Why not b? It would be difficult to invade around c anyways. After this black can try for a slide. Of course, this is just my personal opinion. Anonymous: IMVVHO, it seems like White will have a tough time living in there, and Black turns his two groups into a massive wall of influence. Maybe a higher approach, aiming to reduce Black's territory on the left and then run for one side or the other, is indicated--say, at b. This was my feeling too. Can somebody explain why this is wrong? anonymous White b is definitely better than . 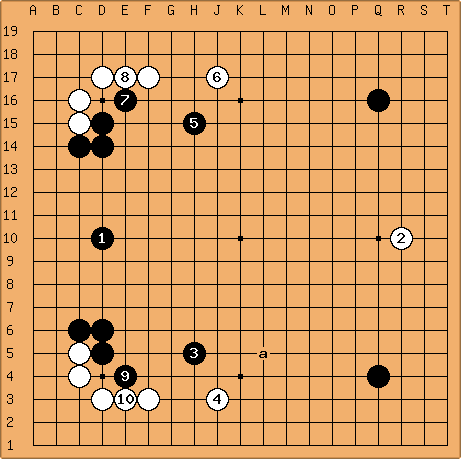 White's two extremely strong groups in the upper and lower left corners erase the influence of the Black san-ren-sei. A high move at b makes Blacks two three-stone groups heavy, too. BTW, those strong White groups in the upper left and lower left corners also limit somewhat Black's potential in the center on the left.